Pre-1980 figure prototypes are extremely scarce. And when they have turned up, they have tended to be first shots injection molded in the colors of plastic used during mass production. In other words, they aren't incredibly interesting. 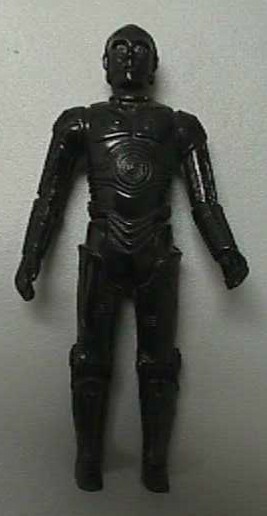 This figure, however, is a great prototype example of one of the first 12 Star Wars action figures. As you can surely see, the primary point of interest about the piece is its odd color--while production C-3POs were shot in a whitish color of plastic and then vac-metallized, this one is black and has no metallic coating at all. Other than that, there isn't much about the figure that's notable. It has holes in its feet, for instance, and, like most first shots, it lacks the date and copyright information from the back of its leg. But it's that black coloring makes this one a real attention-getter.